Gużi Micallef – first to play a defensive centre-half role. Ġużi Micallef was possibly the best Maltese centre-half of his era, rivalling even the great Gejtu Psaila who at the time was approaching the end of a long and glorious career. Micallef started his career in 1911 with Melita Vittoriosa. The records for this period are very sketchy and it is difficult to follow this fine player’s career. We know for certain, however, that when in 1914 Melita Vittoriosa were disbanded, he joined Vittoriosa Rovers, a new outfit which was formed from the nucleus of the old club. With Rovers, Micallef stayed up to 1917. 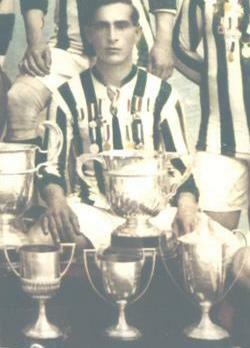 In 1920, he joined Floriana and in the six seasons he played for the Greens he won seven major honours which included three championships, two Cassar Cups and two cup medals. According to old-timers, Micallef was best noted for the way he played and later became known as the ‘third back game’. In Micallef’s time, the two full-backs were the only defenders in the team. The centre-half was what we would call nowadays an attacking midfielder. In 1925, however, the offside law was changed and this created havoc because the number of goals scored in a season more than doubled. The scoring rate in the English league had accelerated so much that the legislators wondered whether they had done the right thing in reducing the number of defenders from three to two for an attacker to be offside. During one Saturday in the English league, seven matches produced a crop of 64 goals! Something had to be done and it needed to be done quickly if the game was to remain a spectacle. Fortunately, soon after the introduction of the new rule a great footballing character appeared on the scene. His name was Charlie Buchan. Buchan was one of the greatest inside forwards ever produced by the English game and, like Billy McCraken, who was responsible for the change in the laws, he could use his head as well as his feet. One day, during his playing days with Arsenal, he pulled aside his manager, the famous Herbert Chapman, and outlined a plan to stop the avalanche of goals which his team was conceding because of the new offside law. Buchan’s plan was to make the full-backs mark the wingers and the half-backs the inside-forwards. The centre-half was pulled back from midfield to mark the opposing centre-forward. One of the insides was then given a midfield role to fill the gap left by the centre-half. Thus the famous ‘third back game’ was born. Chapman adopted Buchan’s plan and Arsenal moved from obscurity to the top spot of the English League. Under Chapman’s guidance the club won three consecutive championships and the FA Cup once. The change in laws and the new tactics adopted by the English clubs soon reached our islands via the Service teams. At first, however, the Maltese found it difficult to adapt themselves to the new circumstances, but the Maltese learn quickly and soon our clubs, especially Sliema Wanderers and Floriana, were deploying the new tactics successfully. At first there was much confusion and for a time the Service teams had the edge over the civilians. The first players to adopt the ‘third back game’ in Malta were Archie Caunter, of Sliema Wanderers, and Micallef, of Floriana. And the man who mastered the new centre-half role was Eddie Cole, of Melita FC and Sliema Wanderers. He played the pivot, centre-half role to perfection. To Micallef, however, goes the honour of being the first Maltese footballer to play a purely defensive centre-half role in the famous ‘third back game’.